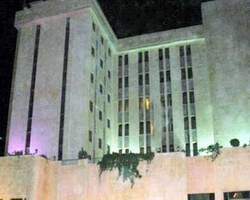 Carlton Hotel Idlib's Rooms are furnished with a hi levels of comfort & elegance, dressing table and marble bath, all rooms are equipped with good standard amenities and some has the view of the swimming pool. Carlton Hotel main restaurant serving one of the best local cuisine as well as few international dishes. Medium, marble floor and large seats all around the place, light colour marble reception with a wood wall decorations.